After a dry spell in the ‘good food department’ in Croatia and Bosnia, I was desperately in need of a nice meal. My taste buds demanded it. And so I found myself in Cologne, Germany, with the priority being to eat. First on the agenda was Gut Lärchenhof, a one star Michelin restaurant situated in the village of Pulheim-Stommeln which is about 16km from the centre of Cologne. 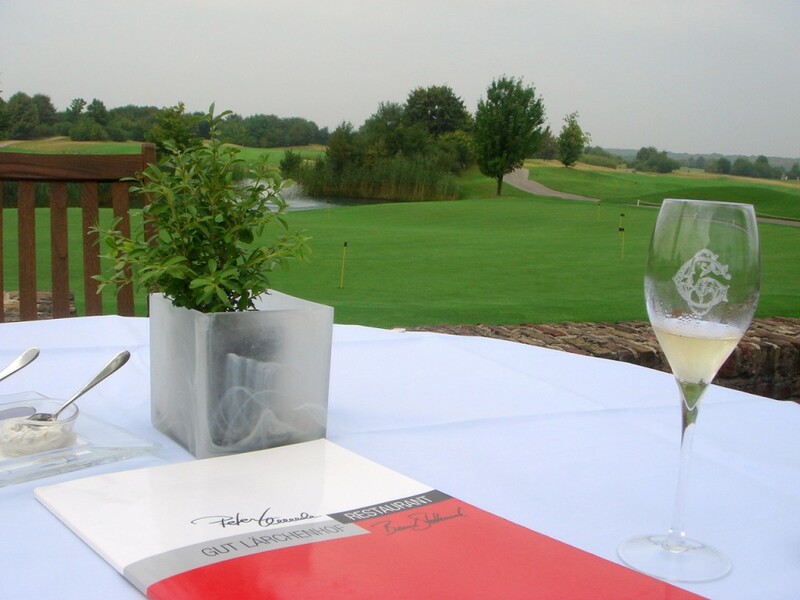 What is most interesting about this restaurant’s location is not where it is, but the fact that it is housed in a golf course, one that was designed by Jack Nicholas. Some of you might think it odd that I would make the effort to venture to a golf course for a reason other than golf, and even if you didn’t, I will hold my hand up and admit that I did spend a short moment in quiet reflection trying to decide if I was indeed ‘odd’. But I have never been shy about going to extreme lengths in pursuit of a good meal (and indeed I have had some harebrained escapades- but that is a story for another time). Besides, I was intrigued by this place, which after some internal debate, I choose over Zur Traube, a two star Michelin restaurant also situated in the Cologne area. Interestingly, despite having one less star, Gut Lärchenhof holds 18 Gault Millau points, the same as Zur Traube. But Gut Lärchenhof is itself expecting a second star in the upcoming year, and restaurants such as these, hungry for that extra star, often have something to prove. Consequently, I believe they often provide excellent dining experiences. So, speeding down the autobahn in a taxi, I covered the 16km in no time. The restaurant has the look of a country club with its pinewood features and is pleasant and comfortable. It overlooks the golf course (obviously), and in my non-professional opinion, the course looked pretty good (but less so some of the golfers who were playing on it). I started my lunch indoors, for it was a little overcast. But once it was certain that it was not going to rain, I was moved to a table on the patio. Eating my lunch while looking onto the greens and listening to the sounds of the water feature proved very relaxing. I can’t remember the last time I enjoyed being at a golf course so much and I could have easily dozed off then and there. The `a la carte menu only has one choice per course, but I was told I could choose whatever I wanted from the degustation menu without taking a set number of courses from it. 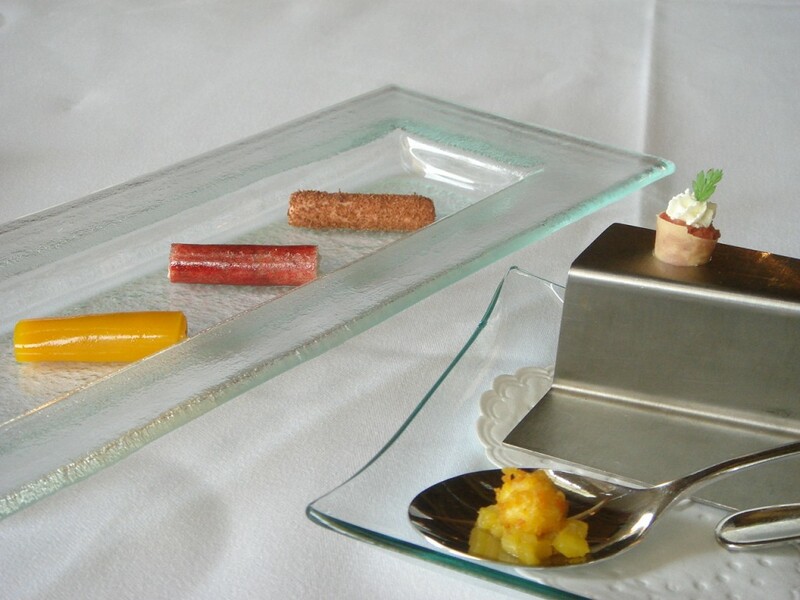 So in that respect, one can count the items listed in the degustation as part of the `a la carte. 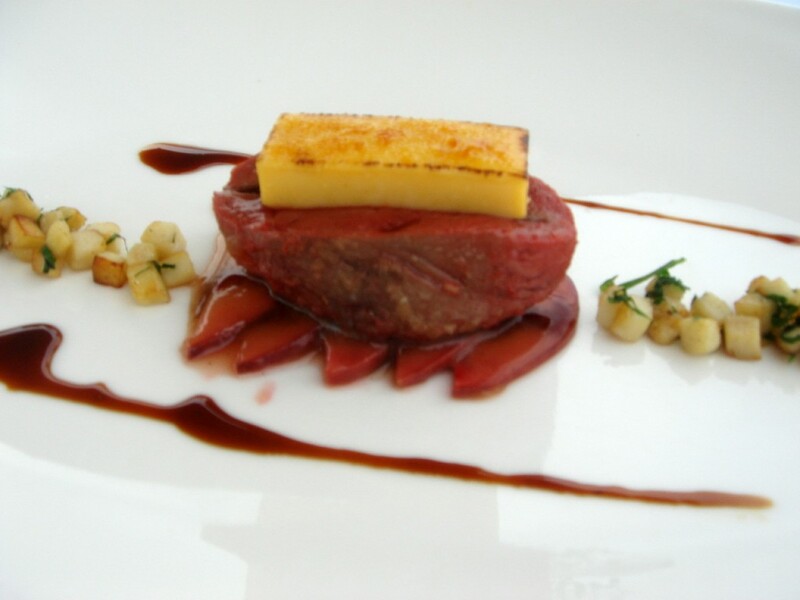 The degustation has the option of four, six or eight courses (€79, €110 and €135 respectively), and there is also a four course ‘petit menu’ ( €65). I settled on four courses from the degustation menu. First up were the canapés which included (from the bottom item in the picture in an anti-clockwise direction) a fried tartare of scampi and pineapple, tartare of veal with crème fraiche, tomato mousse coated with chocolate, a beetroot roll with herring mousse, and a mango roll filled with tuna. These boasted some nice flavours. Particularly tasty was the tartare of scampi and pineapple which was really refreshing, although in the case of the tomato mousse, the chocolate clashed with the delicacy of the tomato. 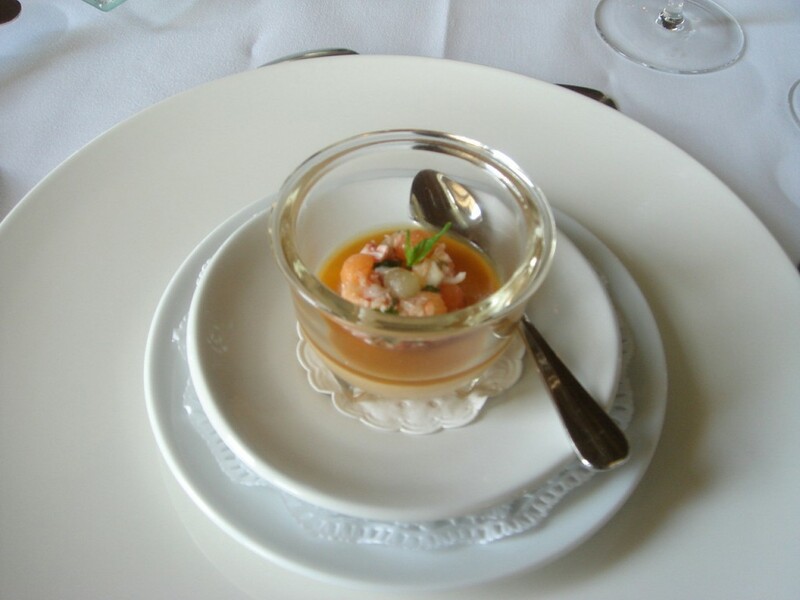 The first amuse bouche was a lobster mousse with lobster and melon salad. This was excellent. The mousse, set with a layer of melon jelly, was intense with the flavour of lobster, and the jelly helped to cut this richness nicely. The salad was refreshing and summery. It also contained some finely cut parsley that was so aromatic I was taken by surprise with the depth and loveliness of its flavour. 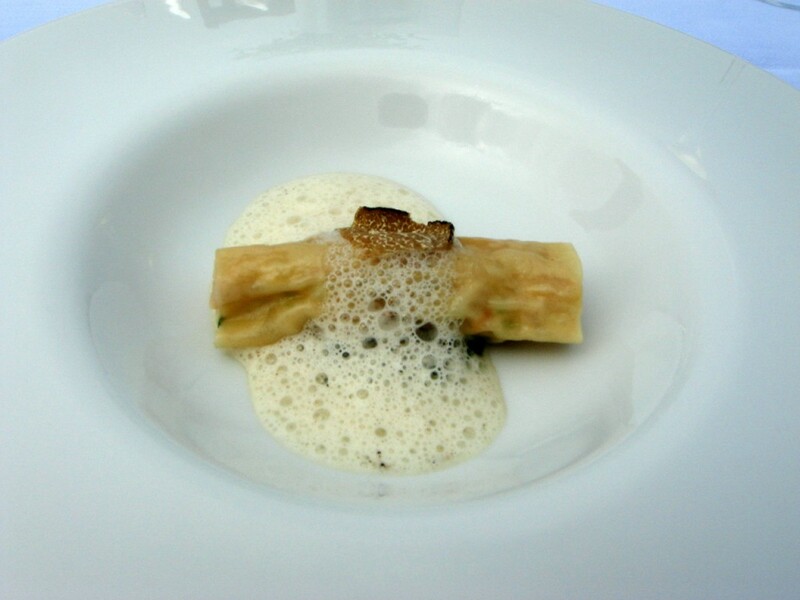 The second amuse bouche (this was a treat as only one amuse bouche was listed on the menu) was sot l’y laisse of guinea fowl wrapped in pasta with summer truffle and spinach mousse (sot l’y laisse translates as chicken oysters, or in this case, guinea fowl oysters). The mix of flavours were rather delicate, but they worked well together and left a lovely aftertaste. Next was a variation of goose liver and gooseberries. 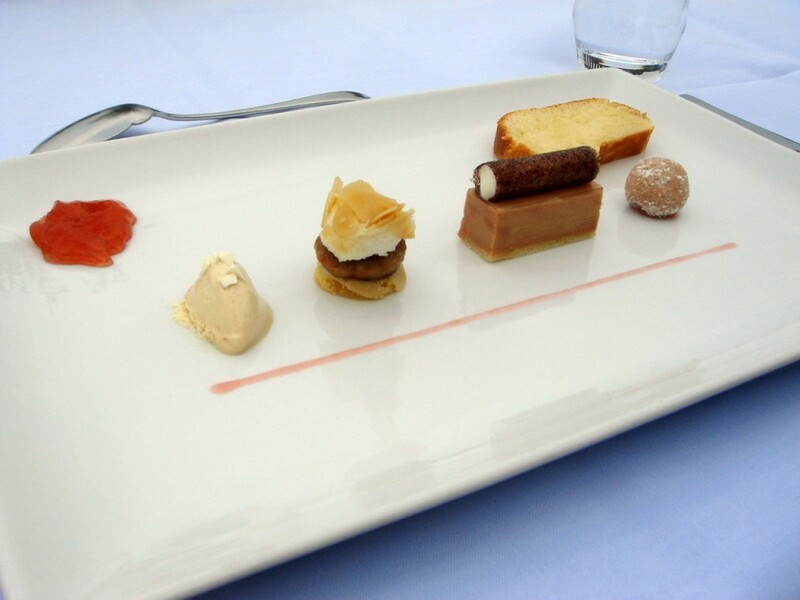 From left to right in the picutre there was a cream of goose liver with yoghurt crisps; a tart of pan fried goose liver and gooseberries; a terrine of goose liver with gooseberry jelly, a Tasmanian pepper roll with yoghurt foam; and a praline of goose liver with a hint of yoghurt. The cream was delicious with its rich, velvety tones, and the yoghurt crisps added a delightful crunchiness to it. The tart was also excellent with the subtle sweetness of the gooseberries merging into decadence of the foie gras quite nicely. The terrine and the praline fared less well as the tanginess of the yoghurt worked against, rather than with, the goose liver. Langoustine featured in the seafood course. 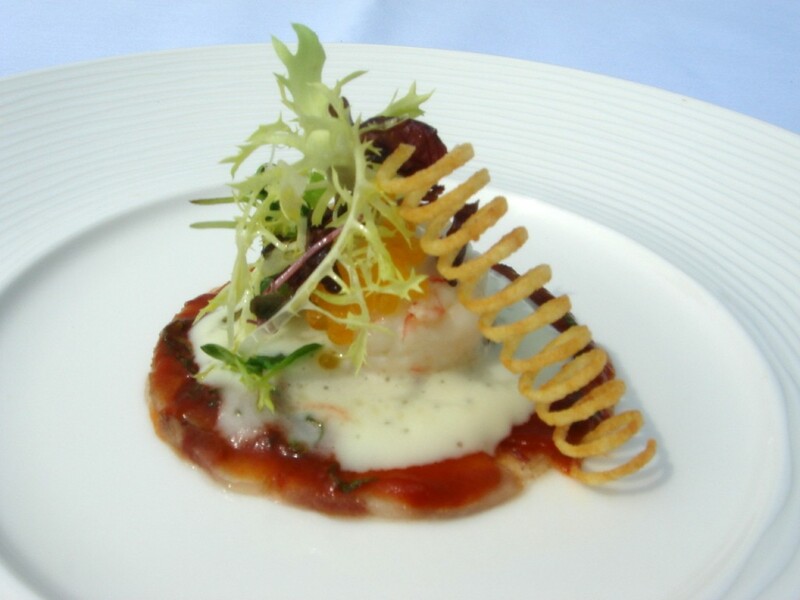 A thin layer of very tender calf’s head laid the foundation for this beautiful dish, which was then topped with a layer of tomato oil, warm potato foam, langoustine, crème fraiche and char caviar. Both the tomato oil and the caviar accentuated the dish with their sweetness, and while the langoustine was not as firm as I would have liked and a little mushy, the combination of the ingredients worked really well here. There was a real depth and balance in the composition of this dish. The meat course was Mireal pigeon with roasted vine peaches, ceps and lavender brulee. The pigeon is named after Jean-Claud Mieral, who is famed for the birds that he breeds in Bresse. I was told that this particular pigeon was hung so that the blood flowed back into the flesh, thereby intensifying its flavour. The pigeon was nothing short of exquisite – tender and moist, it delivered a taste that was intensely pure and natural. Both the peaches and the brulee complemented the richness of the pigeon (although on its own the brulee was a little eggy). There was also a lovely reduction of pan juices, and the slightly crunchy ceps also added a nice bite to the dish. Overall, this was a course to savour. 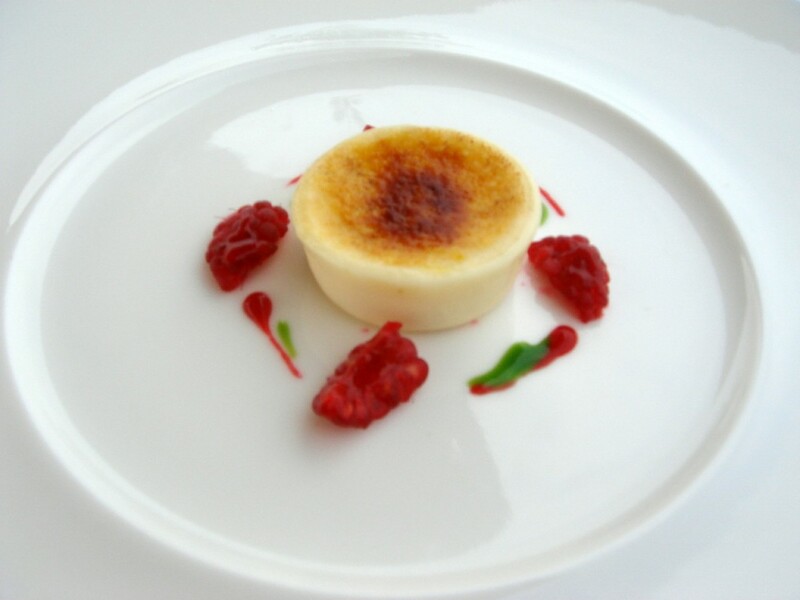 A caramelised lemon cream with raspberries acted as the pre-dessert. Pretty as a picture, it was lovely, light and zingy, but not too tart. It was served slightly cool which made it quite refreshing. 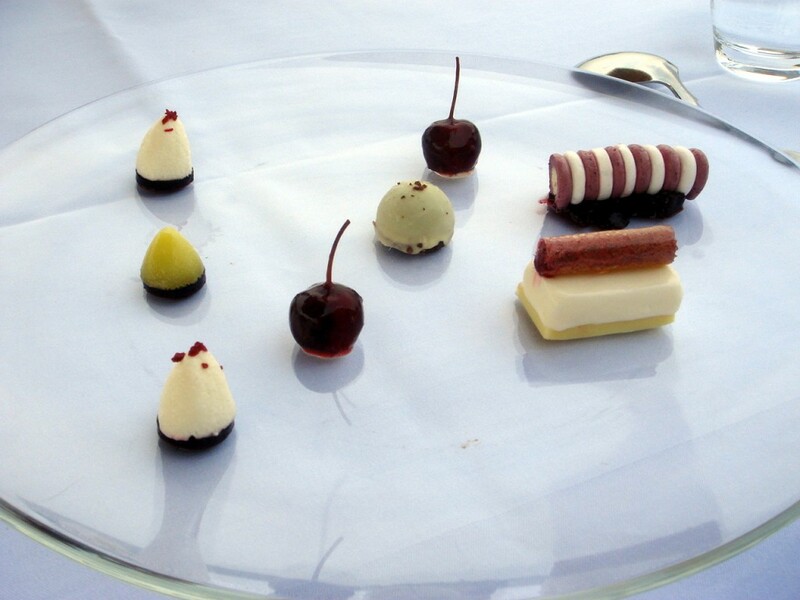 To dessert which was a variation of white chocolate and cherries. There was a white chocolate mousse bedded over cherry jelly; toffee of white chocolate and olive oil; praline of chocolate stuffed with cherries; white chocolate and cherry marshmallows filled with yoghurt; and a white chocolate parfait. The parfait was delicious, although the toffee of white chocolate and olive oil was a little overbearing as it was heavy with the taste of olive oil. Overall, this was an enjoyable dessert and visually very engaging, but it did not quite ‘wow’ me in the way that some of the savoury dishes had. I appreciated this dish more than I enjoyed it. 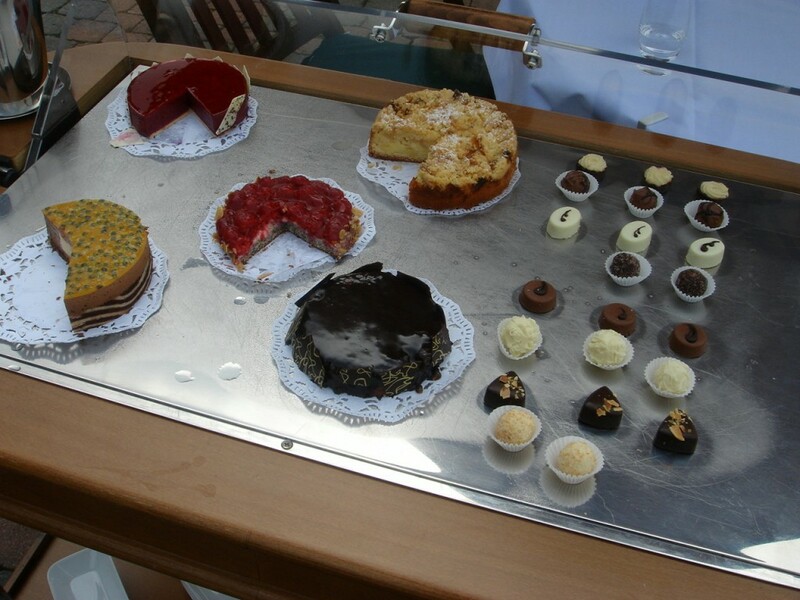 The petits fours came on a trolley and included a selection of cakes and chocolates. The streusel, a German Specialty cake, was particularly delicious as it was buttery and light. The remainder were all very good too. There was a large variety of breads, white, brown, seeded, etc, and all were fairly tasty. 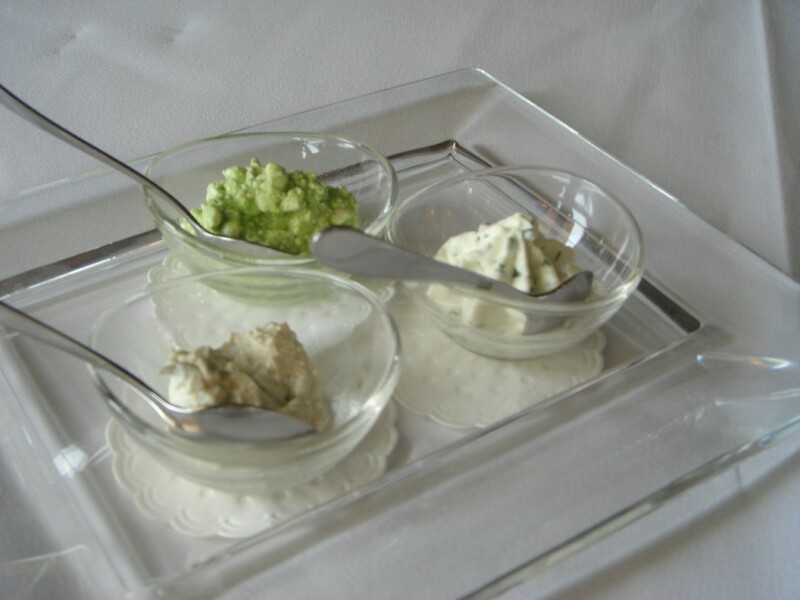 In addition to salted butter, there was also a selection of cottage cheeses flavoured with other ingredients to spread on the bread (with pesto; chill, almond and chives; and herbs). On the service – this was nothing short of exceptional. I was waited on hand and foot, and for want of a better phrase ’treated like a princess’. I found the waiting staff welcoming and unpretentious, and there was a genuine warmth and an eagerness to please in the way they interacted with me. Overall, the food was excellent, and the pigeon was truly exceptional. Many flavours lingered on my palate long after I finished a dish – a true sign of good food. It wasn’t perfect in every regard – for example, the combination of the yoghurt with the goose liver did not work as well as it could have – but its excellence outweighed its few minor faults. The service and the lovely outdoor setting also worked a certain charm, and this lunch at Gut Lärchenhoff was one of the loveliest all-round dining experiences I have experienced. Some restaurants boast of great food – but a meal becomes truly magical when you are able to combine it with fantastic service and a great setting, and for this reason, I was happy the weather held for eating the entire meal indoors would have yielded a different experience. Gut Lärchenhoff is a place that I would happily go again, and in my opinion it’s worthy of that extra star. Prices listed above. Excludes drink and service. Sounds like you found a really good meal at last, after the less than perfect experiences in Croatia and Bosnia. My dad made the same trip many years ago from Dubrovnik up the Neretva valley to Sarajevo and told me that the food was interesting, but not exactly something to write home about. But then he turned the other way from you and headed down through Serbia to Bulgaria and began to appreciate Bosnian food. Borderline 1/2 star food is where I’m at right now and it’s the constant striving for perfect execution that makes it really challenging and worthwhile. Yes, it sounds like I had a similar experience to your dad. Croatian food is not particularly exciting! Hang in there. It’s hard work striving for perfection, but when you get there, it will be worth it.